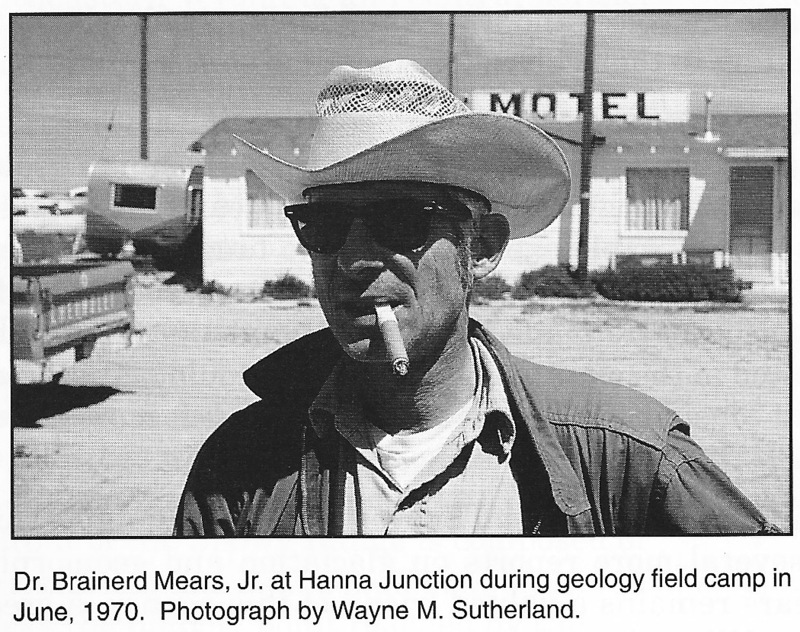 My most important geology teacher -- Dr. Brainerd “Nip” Mears, Jr. This post is my contribution to Accretionary Wedge #44. Yellowstone National Park. Nip Mears kneeling on left, in red hat. My profession is field botany, but I love things geological, especially landforms and the stories behind them. In fact, I’m a bit obsessed. I take geo-vacations -- I pick some part of the western United States, learn about the regional geology and then go geo-touring. Much of my appreciation comes from classes in geomorphology -- the Queen of the Earth Sciences -- that I took while a Botany grad student at the University of Wyoming. All were taught by Dr. Brainerd “Nip” Mears, Jr., and so Doc Mears faces no competition for this honor. Still, the knowledge, skills, enthusiasm and wonderful field trip memories that he provided me are evidence enough that the title "most important geology teacher” is fully deserved. 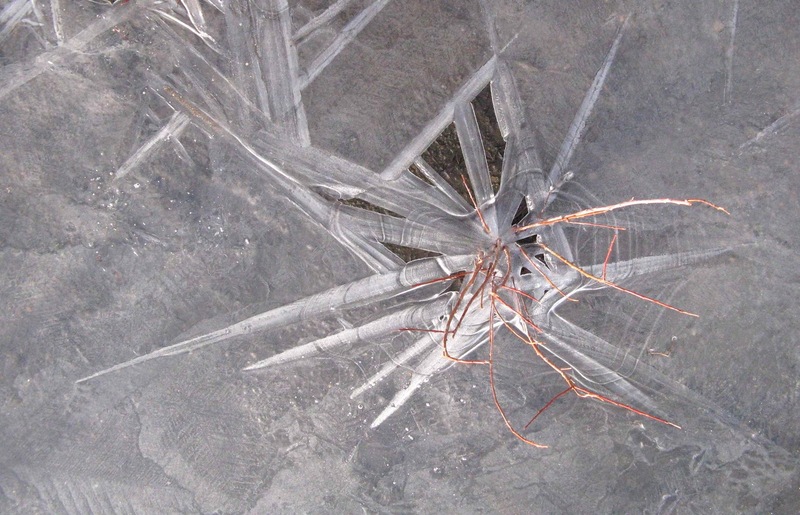 Fossil frost polygons exposed in highway construction; Mears 1987. “Dr. Mears was the most sincere, caring instructor. His door was always open and he was always willing to give his students his most valuable possessions: time and knowledge. He could have closed his door, written more papers, and received more grants and research accolades. Instead he chose the unselfish path of doing research and writing during evenings and weekends”. 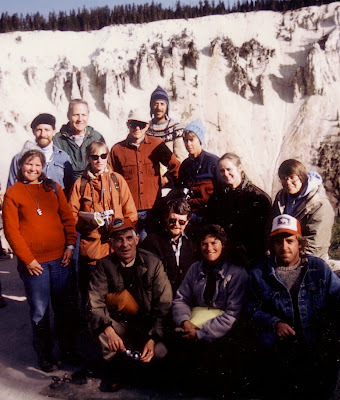 In one of Mears’s last publications, Glacial records in the Medicine Bow Mountains and Sierra Madre of southern Wyoming and adjacent Colorado, there are three “Forward”s -- one by a colleague, one by a student and one by the editor -- all tributes. 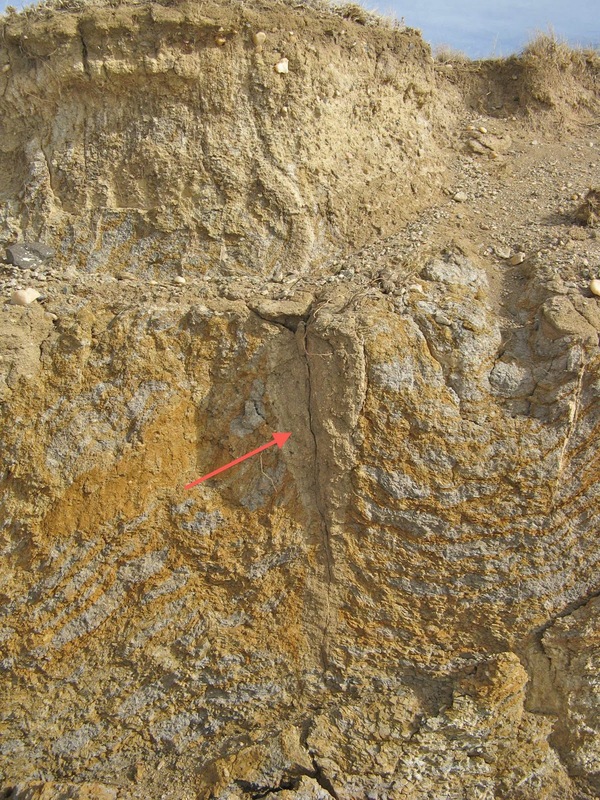 The colleague described Nip’s pioneering work on Pleistocene environments in Wyoming, including his discovery of periglacial wedges in the basins. 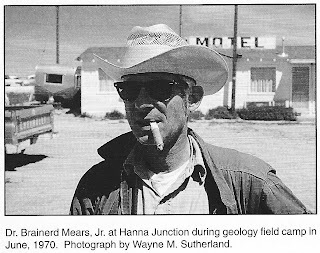 His student mentioned his devotion to “Geomorphology, the Queen of the Earth Sciences”, and anointed Mears “King of the Earth Sciences”. 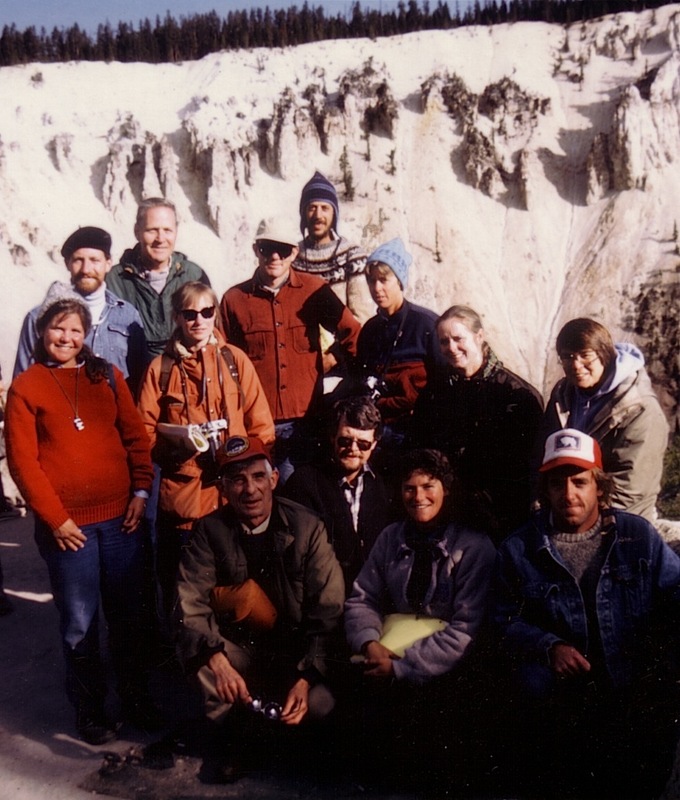 The editor, also a former student, wrote: “Nearly every field trip with him was a memorable experience, as he taught his students the importance of keen observation and rigorous scientific method as well as the necessity for field geology”. Memorable experiences indeed! One of the more vivid field trip memories I have is of an October trip in the Laramie Basin to look at fossil periglacial wedges. At a ditch especially rich in wedge cross-sections, we were busy taking taking notes while Nip lectured in his distinctive baritone about Pleistocene basin environments ... when it started to snow. He kept going, waving his fist in the air for emphasis. 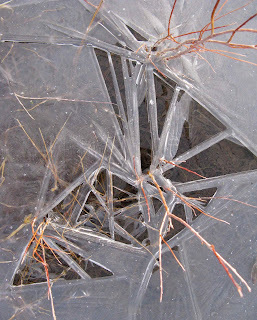 He was talking about strong winds that kept basin surfaces largely snow-free, allowing rapid freezing and cracking ... when the wind picked up as if on cue. Then he mentioned that if the mean annual air temperature were just 5º C cooler, the Laramie Basin would return to periglacial conditions. I didn’t doubt it at all, in fact the return seemed to be upon us at that moment! But no matter, Mears kept talking enthusiastically, an enthusiasm that was contagious. It was so neat to be able to “see” what the Laramie Basin was like during glacial times, and via something as mundane as an irrigation ditch. Laramie Basin, Wyoming. For more, see this post. Looking back, what impresses me most about Doc Mears was his compassion for students. 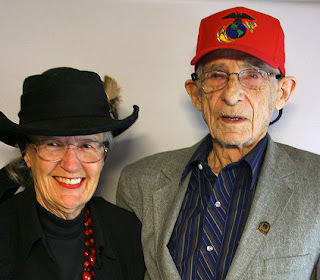 At first glance he seemed rather tough -- a crusty old cigar-smoking field geologist who had served as a Marine in World War II. But I saw many examples of his concern for students, even in my limited time around him. There were little things, like working on learning students’ names and interests during downtime on field trips, and making sure everyone was involved in field discussions (including the botanist). And there were major things -- taking the time to edit my writing in detail with constructive comments, encouraging my interest in plant geography and paleoenvironments, and serving as the outside member on my thesis committee, even asking the most interesting questions during my defense. to establish a $1.4 million endowment for the UW Geology Museum. 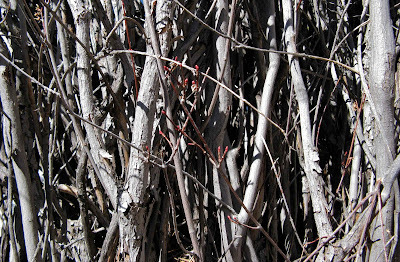 Nip Mears is included also in one of my earliest posts -- The Inconvenience of Vegetation. Mears, B., Jr. 1970. The nature of geology; contemporary readings. New York: Van Nostrand Reinhold Co. Essays and excerpts, ostensibly for beginning students of geology but suitable for anyone who feels the awe inspired by earth science; selected to illustrate the human side of geology -- appreciation, profession, battles, environmental responsibilities and philosophy. Mears, B., Jr., Eckerle, W.P., Gilmer, D.R., Gubbels, T.L., Huckleberry, G.A., Marriott, H.J., Schmidt, K.J., and Yose, L.A. 1986. A geologic tour of Wyoming from Laramie to Lander, Jackson, and Rock Springs. Laramie, WY: Geological Survey of Wyoming. My only geo-publication; the product of a course in advanced geomorphology that culminated in a field trip through western Wyoming. Mears, B., Jr. 1987. 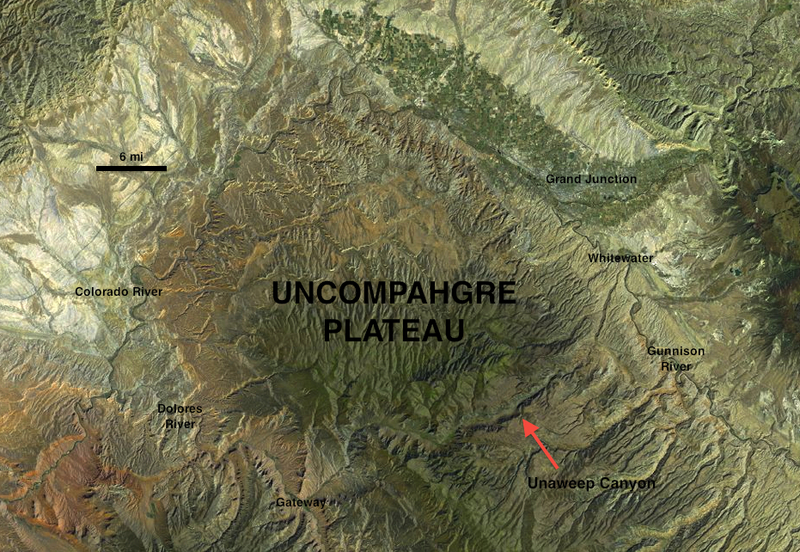 Late Pleistocene periglacial wedge sites in Wyoming: an illustrated compendium. Laramie, WY: Geological Survey of Wyoming. Everything you ever wanted to know about the fascinating fossil periglacial features of Wyoming basins. Mears, B., Jr. 2001. 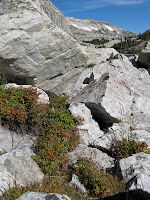 Glacial records in the Medicine Bow Mountains and Sierra Madre of southern Wyoming and adjacent Colorado, with a traveler's guide to their sites. Laramie, WY: Wyoming State Geological Survey. 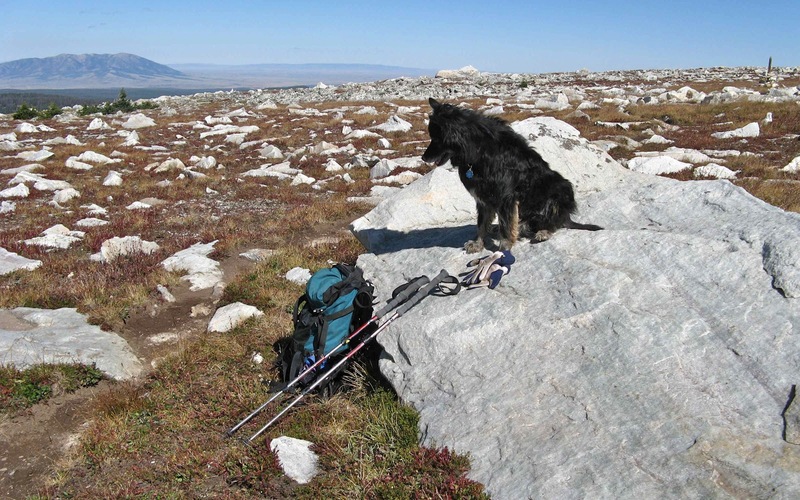 A southeast Wyoming geo-tour -- a great way to spend a weekend or short vacation. Do you know a yam when you see one? Here we have three candidates, all claiming to be yams. At the top is “Mr. 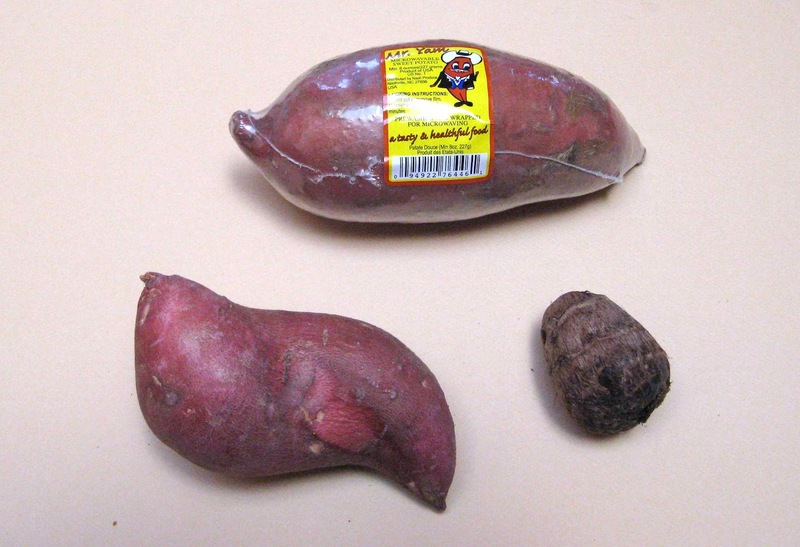 Yam”, wrapped and ready to microwave, courtesy Walmart. Below left is an organic yam from the Big Hollow Food Coop; its shapely form and beauty-marks appeal to the coop's clientele. Finally, the little guy on the lower right is an Asian yam -- keladi in Malaysia and yùtou in China. But wait! ... these are all impostors!! Not one of them is a true yam. 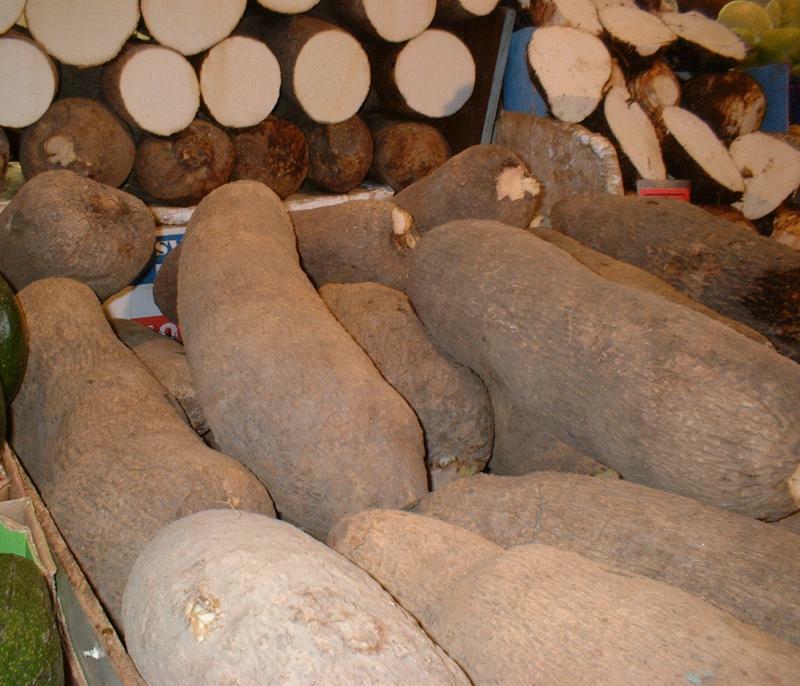 These are true yams (left), starchy tubers from plants of the genus Dioscorea. Yams are grown worldwide, but more than 95% of the world’s crop is produced in Africa. The drawbacks of yams include low nutritional value and large amounts of labor needed to grow them. 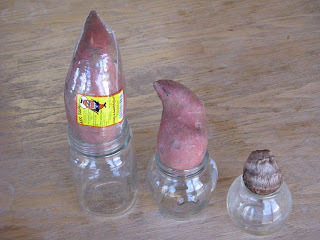 But with only low tech cultivation required and good storability (up to six months without refrigeration), the yam will remain a major food crop, at least until poverty comes to an end. Photo by C Ford. Plants of the genus Dioscorea, the true yams, are perennial vines. The yams themselves are root tubers -- underground structures for storing starch. 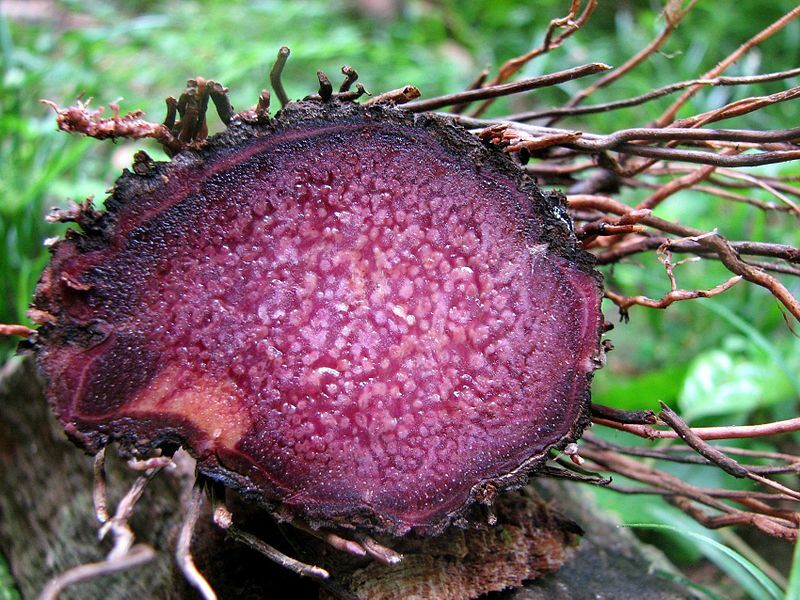 To right, Discorea bulbifera, the air potato. Photo courtesy Forest and Kim Starr. 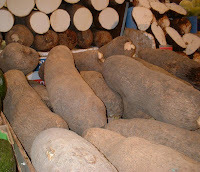 Most yams sold in the United States, like the sensuously-shaped organic yam above, are in reality sweet potatoes, Ipomoea batatas, a member of the morning glory family (photo to left courtesy Indiana State University). 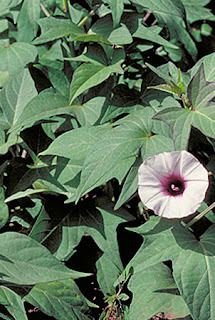 The sweet potato also is a vine with starchy root tubers, but it is not closely related to the true yam. In fact, the latter is a monocot while the sweet potato is a dicot -- in other words they are in different major groups of flowering plants. 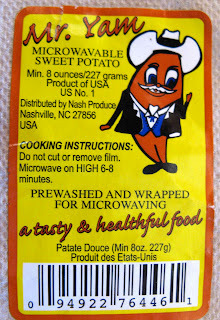 According to the US Department of Agriculture, sweet potatoes sold as yams in the US must be labeled as such, but until I found Mr. Yam in Walmart, I had never seen a US yam sold with the requisite label. of sweet potato, one with softer orange flesh. Some Chinese friends cook a type of yam called yùtou, 芋头 or yùnǎi, 芋艿, which they also call taro -- as do many people around the world. 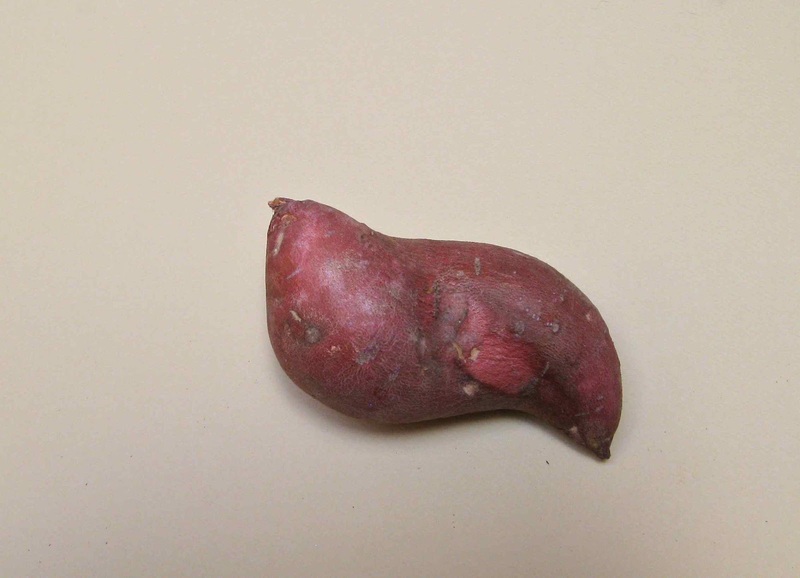 (This is the smallest yam impostor in the first photos above.) 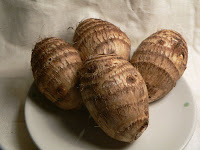 The term "taro" is used for starchy tubers from several different plants in the Araceae or Arum family, most commonly Colocasia esculenta, featured here. Photo to right courtesy Kahuroa. 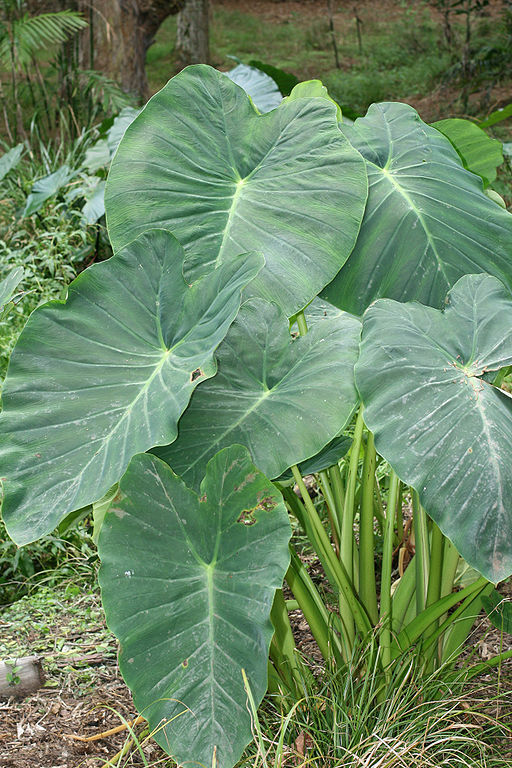 Taro is not closely related to either the sweet potato or the true yam; it is in the same family as calla lily, arum and skunk cabbage. Taro probably is native to the Indo-Malayan region, but now is widely cultivated, especially in southeast Asia, Africa and Oceania. 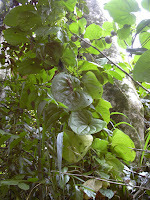 The leaves are edible also. Both the leaves and the tubers contain oxalic acid, and are toxic without cooking. 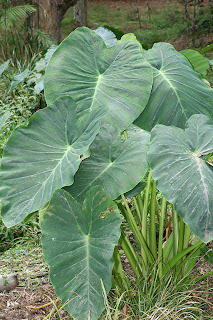 Taro plant, also called "elephant ears". Source. 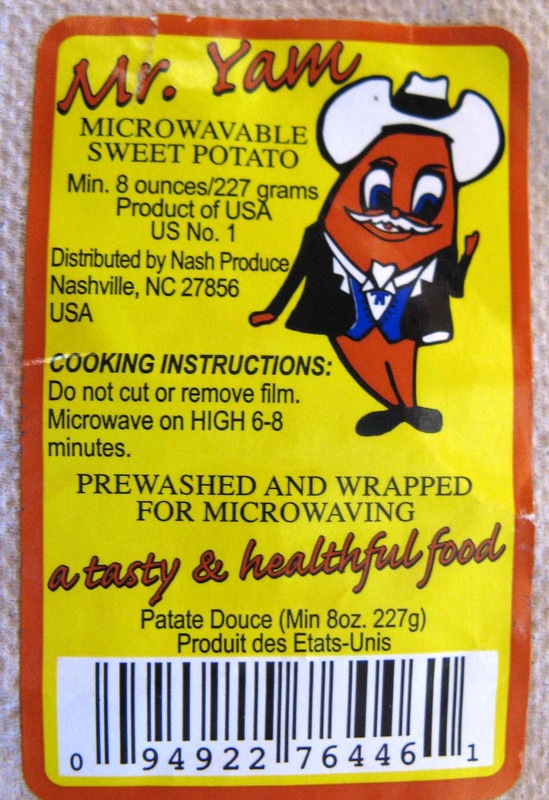 As I write, Mr. Yam has been cooking for 8 minutes on high in the microwave, popping occasionally but without breaking his wrapper. Now he is perfectly cooked and ready to eat. 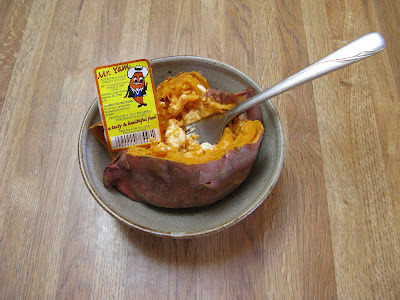 Sweet potatoes are no more "healthful" than true yams ... but they are "tasty" indeed! 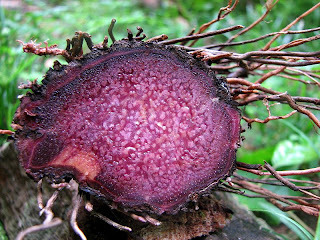 Mr. Yam, "a tasty & healthful food"
"Filipinos are accustomed to purple food from the flavor and coloring of ube — and it must be ingrained in us. Ube flavored food varies from a light shade of lavender to a deep, dark purple. 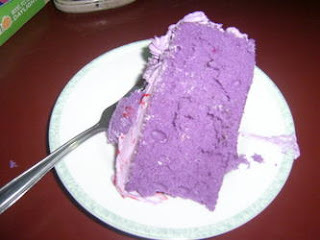 It does not matter the shade as I think I can speak for most Filipinos and Filipino-Americans here, that when we see purple or an ube-shade of food, we immediately think…oh look, purple…yes, it’s ube…its good….get it….eat it!" 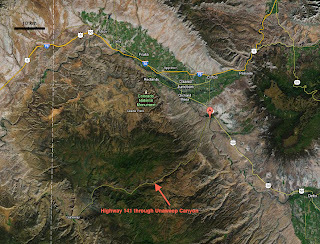 Unaweep Canyon cuts across the Uncompahgre Plateau in western Colorado, USA. Courtesy ArcGIS Online; click to view. 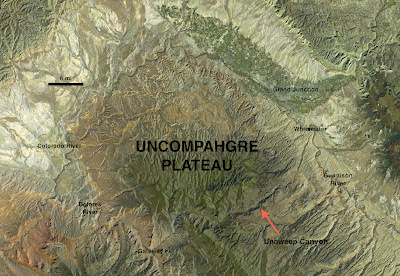 Unaweep Canyon cuts across the Uncompahgre Plateau in western Colorado roughly 15 air miles south of Grand Junction. At first glance, it looks like a superimposed or antecedent drainage, but there is a problem -- a river does not run through it. Instead, two creeks, East and West, run out of the canyon in opposite directions, with the divide between the two in the canyon bottom. In addition, East and West Creeks are underfit, i.e. they are too small to have carved a canyon so deep and so wide. Unaweep has puzzled humans for a long time -- its Ute Indian name means “dividing of waters” or “canyon with two mouths”. One possible explanation is stream piracy: a large river used to run through the canyon, but was captured when headward erosion in a nearby drainage cut through. But which river? The mighty Colorado is an obvious choice; it flows in the same direction through the Grand Valley a short distance north. But no sediments diagnostic of the Colorado River have been found in Unaweep. There are deposits pointing to the Gunnison River, but only in the western part of the canyon. divide is just out of site in distance. 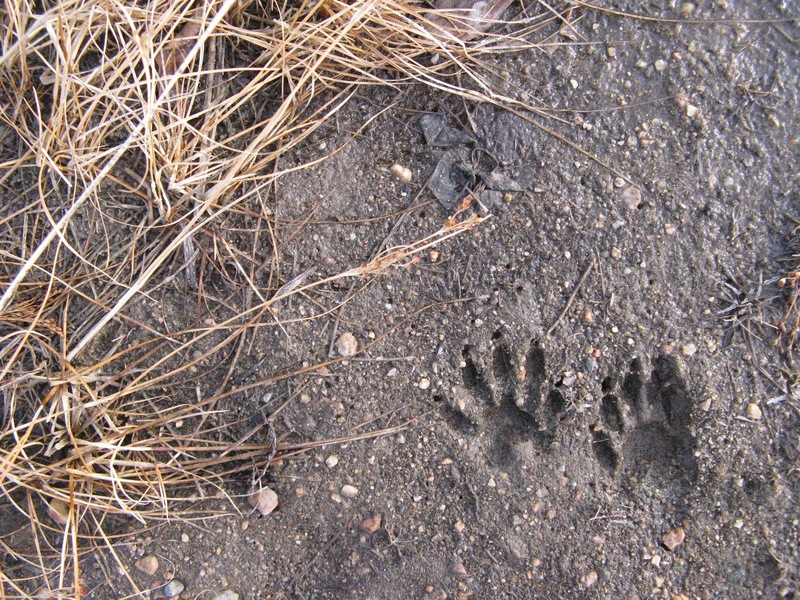 Courtesy National Park Service. The sediment record may suggest the Gunnison, but there is another question -- did the Gunnison River carve the canyon or did it exhume a buried landscape? Soreghan et al. 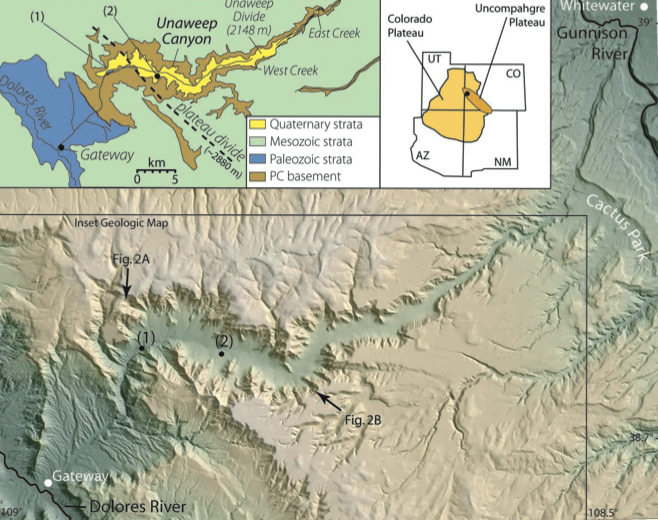 (2007) argue the latter; they propose that Unaweep is a late Paleozoic glacial canyon. Numerous short amphitheater-like tributary drainages in the Precambrian inner gorge are suggestive of cirques. Pollen from late Paleozoic flora has been found in basal canyon fill exposed in road and stream cuts, as well as in samples from a well core. The authors suggest that the original glacial canyon was filled starting in late Paleozoic time. 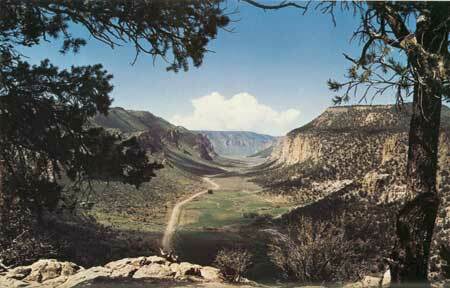 It was exhumed by the ancestral Gunnison River much later, during Neogene time (Miocene and Pliocene). Then the river was blocked, resulting in backfilling until the canyon was abandoned; the Gunnison now flows north to meet the Colorado. Hood (2009) rejects the Paleozoic glacial valley scenario, and provides other possible explanations for the evidence presented by Soreghan et al. They, in turn, respond to each of Hood’s points, and stand by their hypothesis (Soreghan et al. 2009). From Soreghan et al. 2007; note major fault at mouth of West Creek. Whatever its source, Unaweep Canyon offers great geotripping based on my memories from a quick drive-through in 2010. From the east, one travels up the East Creek drainage moving down stratigraphically from Jurrassic sandstones through Permo-Triassic redbeds and finally crossing the Great Unconformity onto Precambrian granite and metamorphic rocks. A short distance further is the divide between East and West Creeks. Continuing down West Creek, Precambrian rocks are exposed as far as the western mouth ... and the fault that bounds the southwest side of the Uncompahgre Plateau. Suddenly there are no more Precambrian rocks. Instead, there are spectacular views of the colorful sedimentary strata of the Colorado Plateau. 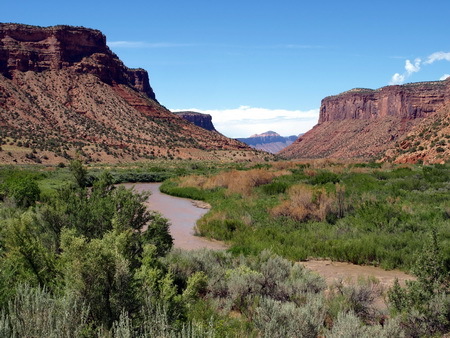 Dolores River, west of the Uncompahgre Plateau. Unaweep Canyon is an easy day trip from Grand Junction, CO, USA. Courtesy Google Maps; click to view. Chronic, Halka. 1980. Roadside geology of Colorado. Missoula MT: Mountain Press Publishing. Update: I just found a 2nd edition (2002), coauthored with Felicie Williams. The treatment of Unaweep Canyon is unchanged from the first edition. Soreghan, G. S.; Sweet, D. E.; Marra, K. R.; Eble, C. F.; Soreghan, M. J.; Elmore, R. D.; Kaplan, S. A.; and Blum, M. D. 2007. An exhumed late Paleozoic canyon in the Rocky Mountains. J. Geol. 115:473–481. With the recent warm weather, I've been thinking a lot about wildflowers. 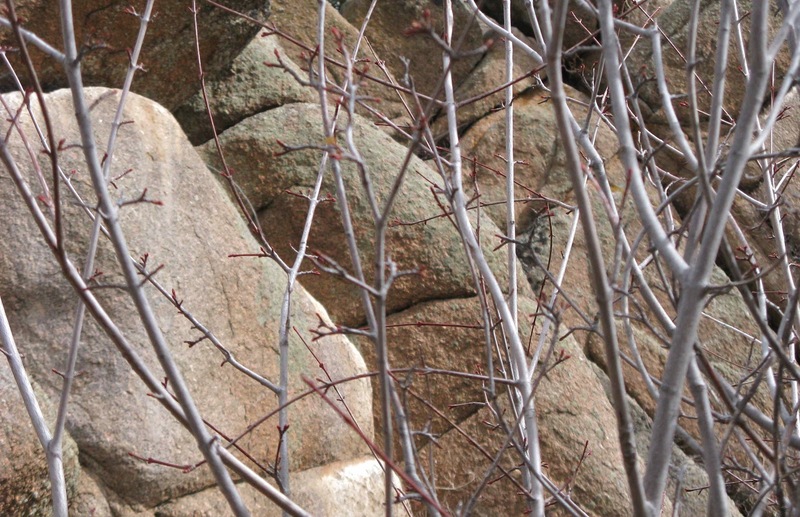 So I made a trip to Curt Gowdy State Park on the east side of the Laramie Range (7000 ft elev) in search of spring plant color in a setting of Precambrian granite. 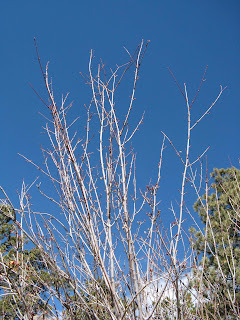 Once there, it hardly felt like spring -- the park was deserted, Granite Springs Reservoir was still frozen, and the aspen were leafless. Still, most of the snow was gone and, as John Muir would say, it was indeed glorious to be on the trails again. I kept my eyes on the open south-facing slopes hoping to catch a flash of yellow (sagebrush buttercup) or white (Easter daisy), but except for some green grass, everything was gray or brown. 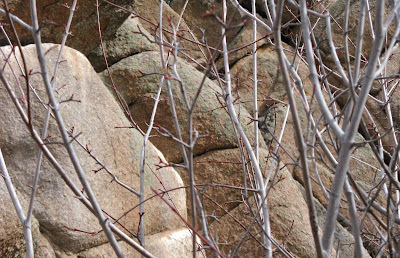 Leafless tree and Sherman granite, a Wyoming spring vignette. Well ... not quite everything. 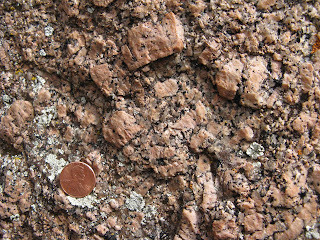 The Sherman granite shone tastefully in the spring sun, with pastel pink feldspar crystals and bits of sparkly quartz and biotite. The fantastical shapes of the tors against blue sky were as enchanting as ever, and of course the pines had kept their dark green needles all winter, getting in a bit of photosynthesis whenever temperatures were warm enough. But I was in the mood for brighter color. 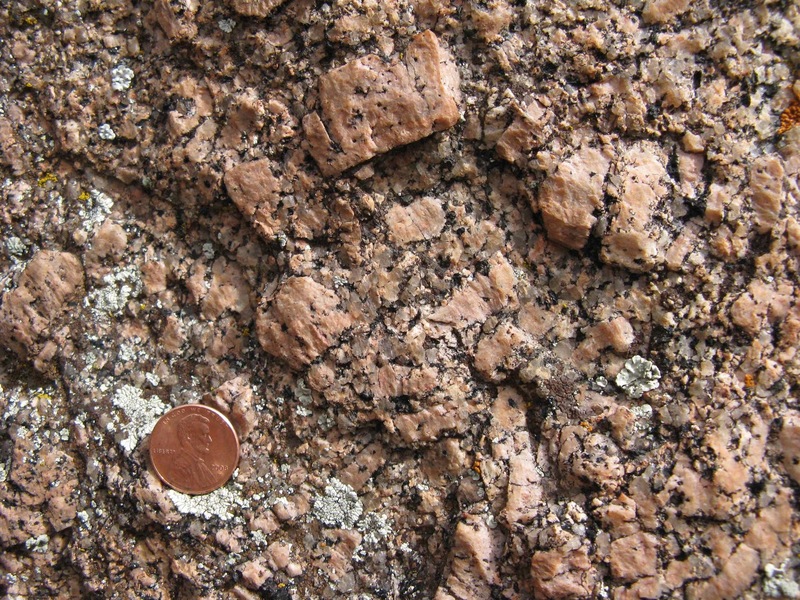 To right and below: Proterozoic Sherman granite; emplaced 1.4 billion years ago just south of the Cheyenne Belt, where Proterozoic terranes had been accreted onto the southern coast of North America only a few hundred million years before. ... buds! 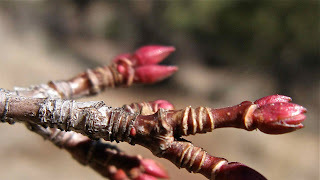 ... the beginnings of the year’s growth, enclosed in bright crimson bud scales. 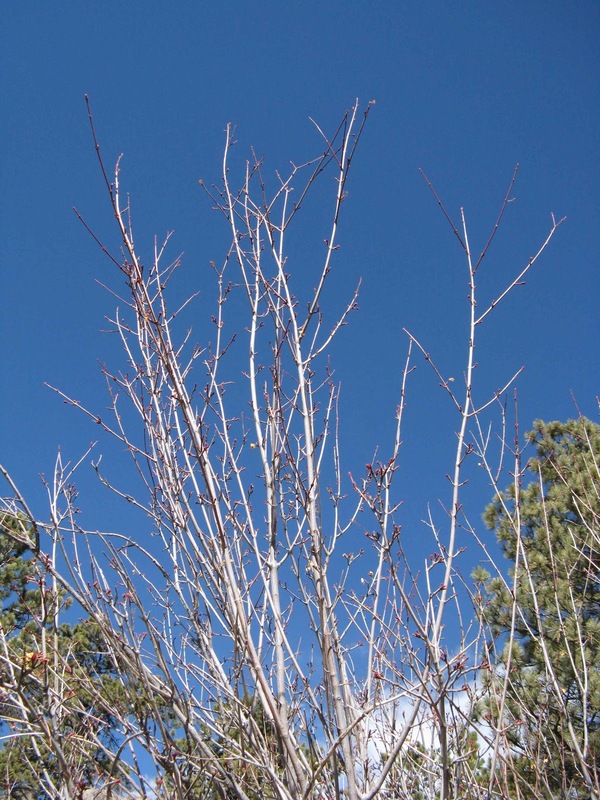 I know this plant, but I decide to use it to test the Winter Tree Finder. This is a simple dichotomous key -- a series of choices that eliminate a subset of trees at each step, finally arriving at the correct determination (for more, see this post). Starting on page 6, I’m asked whether the tree is a conifer ... or not. It's not. Proceeding step by step, I note that my specimen has leaf scars opposite on the twigs (and branches arranged similarly as you can see to right), narrow twigs, narrow leaf scars and a single type of bud, bringing me to the maples. 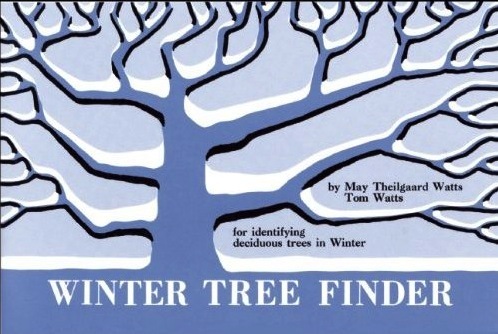 Here I have to stop, as the Winter Tree Finder is limited to eastern and midwestern North America. From Nature Study Guild Publishers. 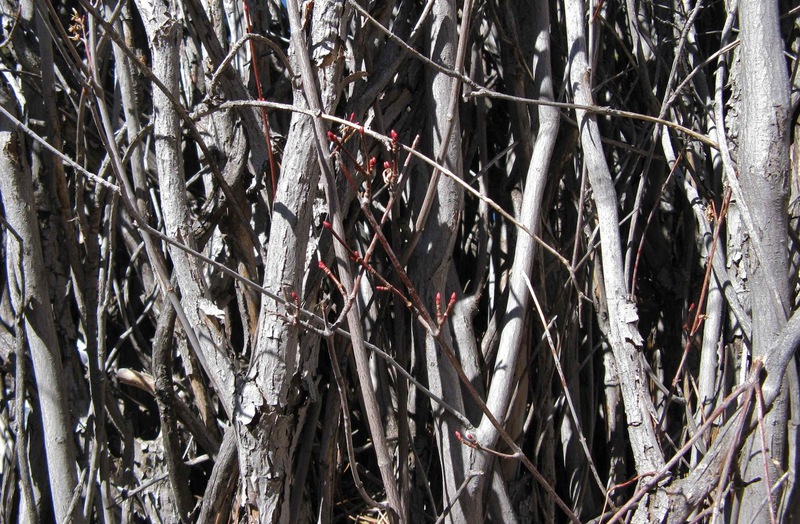 But this is not a problem -- there are just two maples in Wyoming and one, the big-tooth maple, is found only in the southwest part of the state. So this is the Rocky Mountain maple, occasionally a small tree but usually a large shrub with many densely-clustered stems. 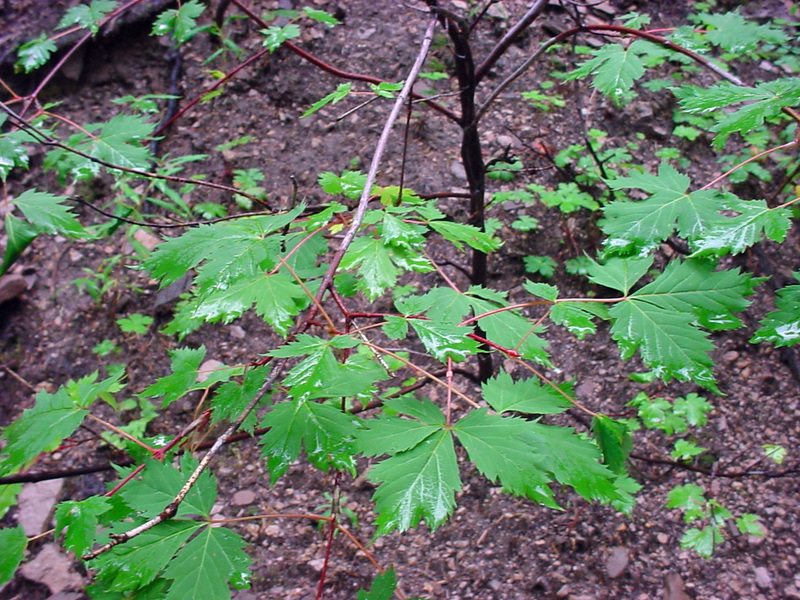 It is widespread in western North America, and grows farther north than any other New World maple -- from southeast Alaska, British Columbia and southwest Alberta south to southern California, Arizona and New Mexico, and east to northwest Nebraska and western South Dakota. 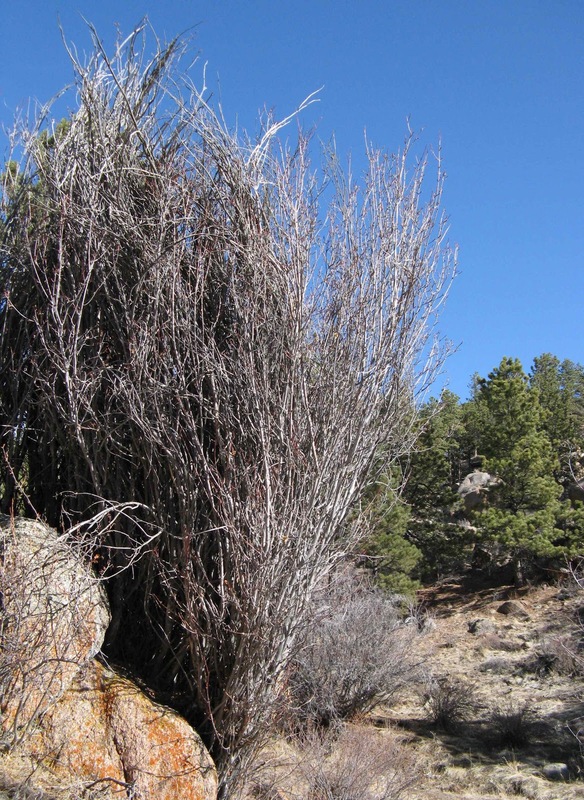 ... and decked out for summer in New Mexico; from Vascular Plants of the Gila Wilderness . Curt Gowdy State Park has a nice network of trails for touring the Sherman granite, open to hikers, bikers and dogs. There are equestrian trails and facilities as well. Maps and additional information are available online. I don’t usually associate Jack Frost with spring, but this morning he proved me wrong. I found an unexpected exhibit of his artwork near the Laramie River, and had to run back home for the camera. It has not been a productive year for Jack. 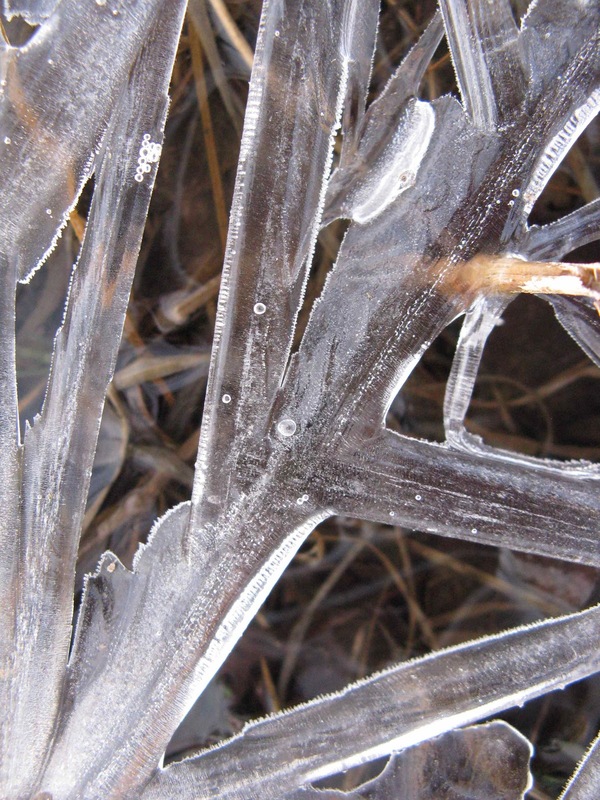 It was a mild winter; we had only one Arctic air mass come through, back in early December. 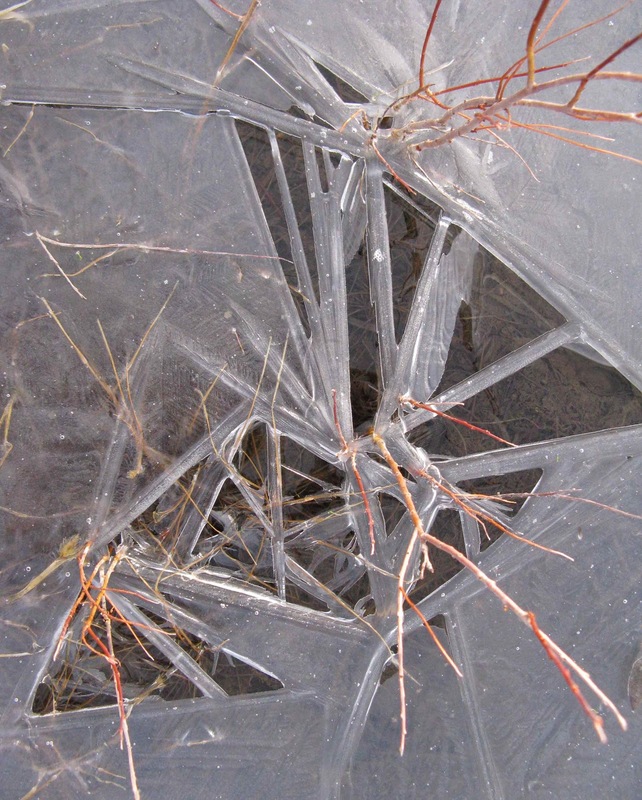 The river never did freeze over entirely, and in fact was largely open. Perhaps lack of opportunity prompted him to put together this wonderful spring show on the flooded trails last night. 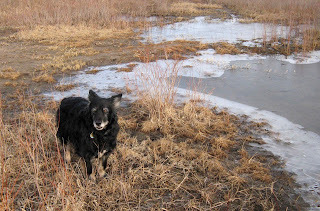 Though the official first day of spring is still three days off, it is definitely spring on the floodplain. Every morning geese fly and honk overhead. 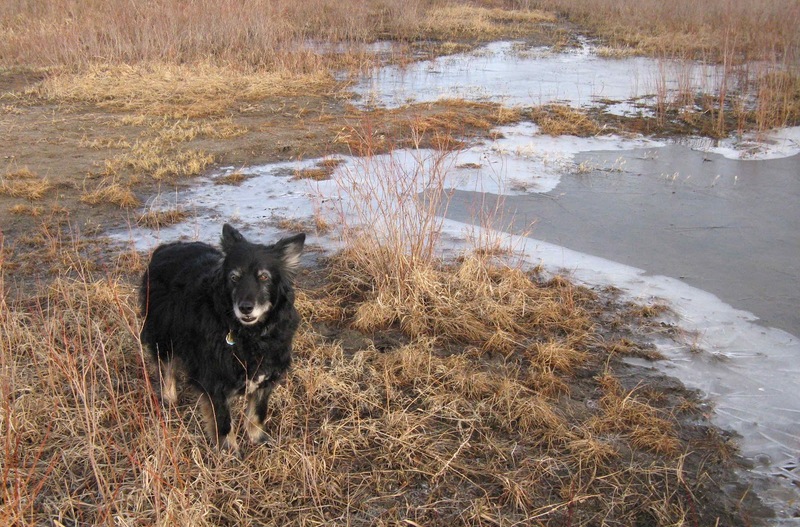 Trails through the cottonwoods and wetlands west of the river already are partially flooded. Pretty soon the area will be impassable, giving the residents several months’ respite from human disturbance. 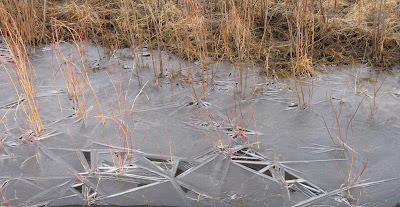 This morning the flooded low spots were frozen, covered with patterned ice very different from winter hoarfrost. 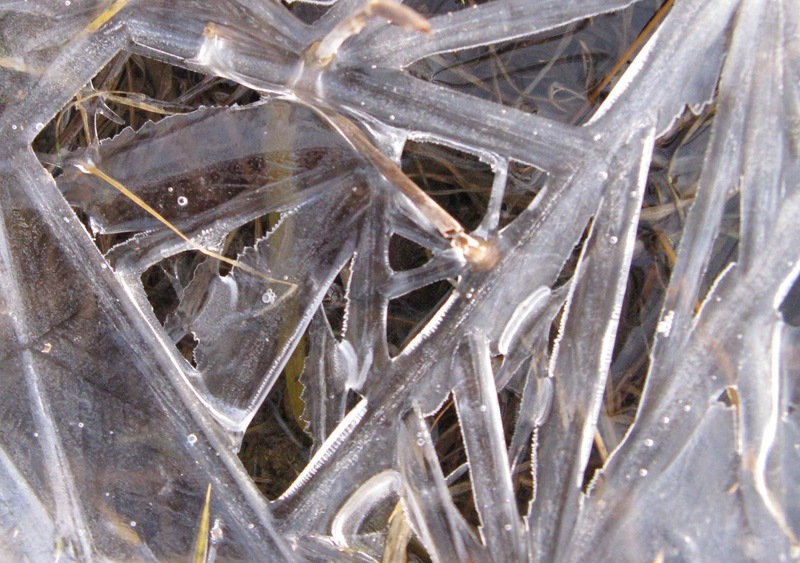 It’s fascinating the way these “crystals” seem to grow out from plants emerging from the water. 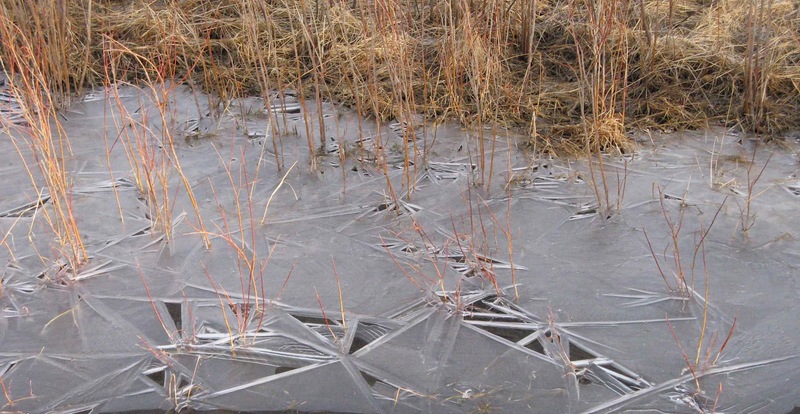 What’s behind such striking patterns? I considered checking online resources for an explanation, but decided not to bother and just enjoy Jack’s creations instead -- might be his last until fall. 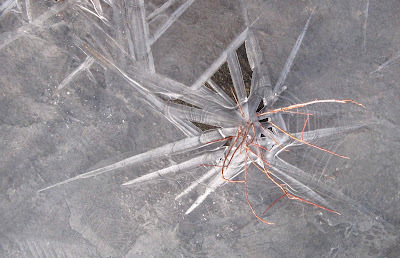 "Ice star" radiating out from plant -- rays are 0.5-1 inch wide. 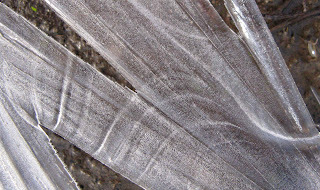 Nice bubble patterns and sawtooth edges ... where? Click to view. Lots of triangular openings -- made from the rays of ice stars. Closeup of a thin piece of ice held against a dark background. 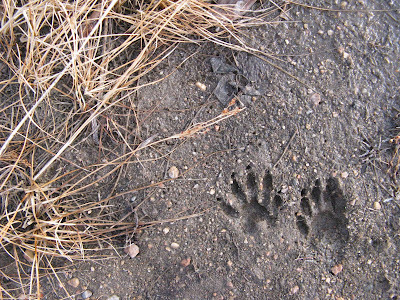 Tracks of an earlier visitor, Mr. Raccoon. 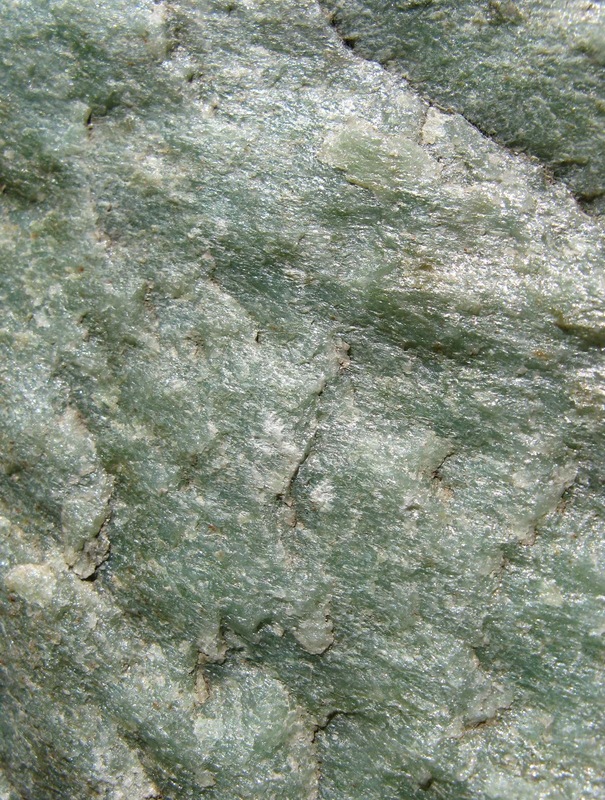 Blackwelder was describing this green quartzite, found west of Big Telephone Lake in the Medicine Bow Mountains. Quartzite is metamorphosed sandstone, shiny and sparkly from quartz that once was sand. It commonly is white, but can take on pastel shades with just small amounts of impurities. 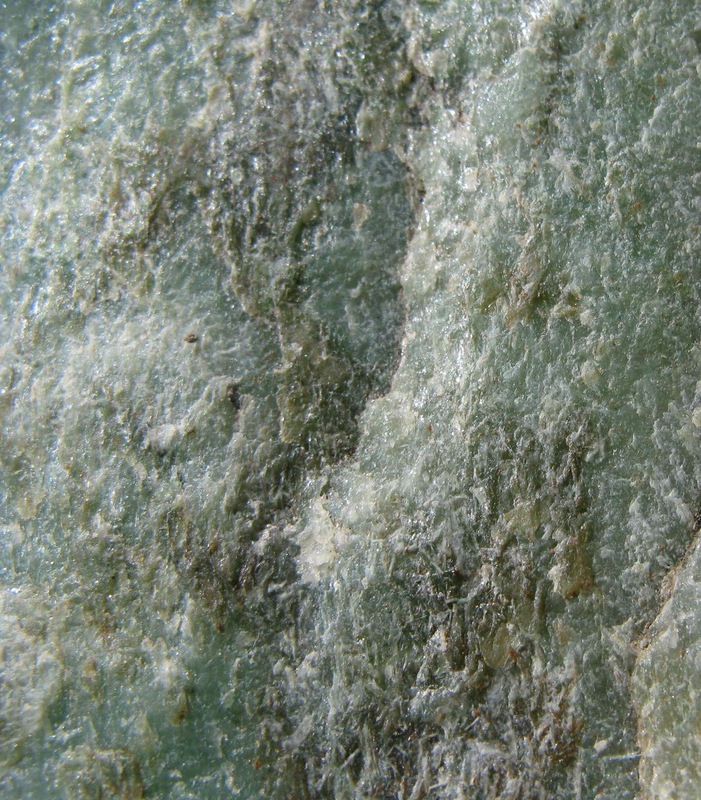 The green quartzite contains fuchsite, a chromium-rich version of muscovite (mica). It is an uncommon form of the Medicine Peak quartzite that makes up much of the Snowy Range on the crest of the Medicine Bow Mountains. broad crest of the Medicine Bow Mountains in southeast Wyoming, USA. Courtesy UW Dept. Geology & Geophysics; click to view. 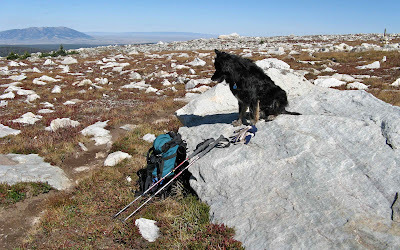 Sparky contemplates quartzite boulders on the backside of Medicine Bow Peak. Proterozoic stata whose age has been bracketed at 2.0 to 2.7 billion years. 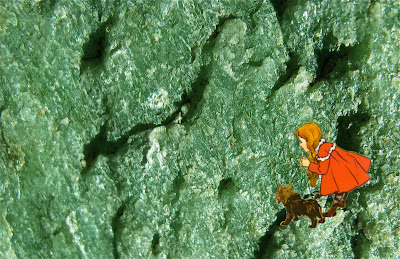 The sand that eventually would become the Medicine Peak quartzite was deposited on beaches and in shallow marine environments approximately 2 billion years ago. It is quite pure, averaging 83-88% quartz, and the grains are rounded, perhaps from being tossed about by waves and currents for so long. 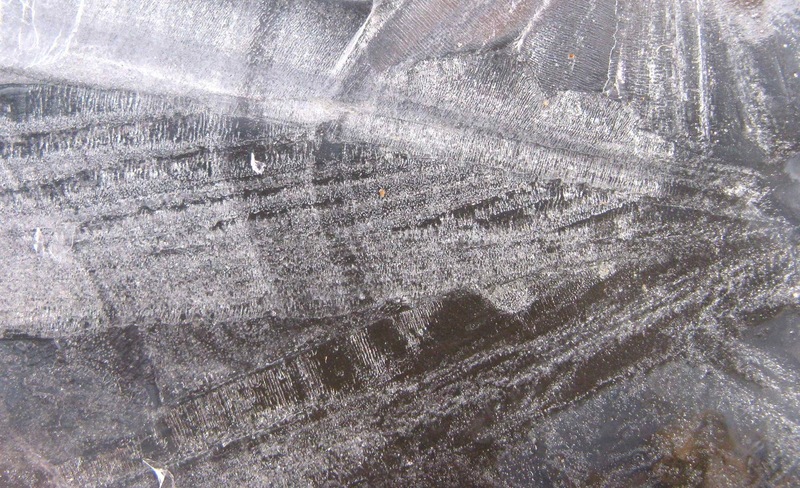 Deposition lasted millions of years, and the resulting formation is massive, to 6000 feet thick. Adding to the spectacle, the quartzite beds have been tilted to almost vertical during the rough-and-tumble life of the North American continent (more below). two billion years ago it was sand along the coast of ancestral North America. When the sands of the Medicine Peak quartzite were being deposited, this part of Wyoming was beachfront property on the southern coast of North America ... but only for several hundred million years. 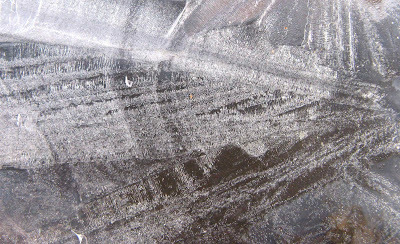 Then, from 1.8 to 1.6 billion years ago, North America expanded to the south and west in a series of crustal collisions. During one of the earliest episodes, land was added to the southern continental margin in what is now Wyoming. 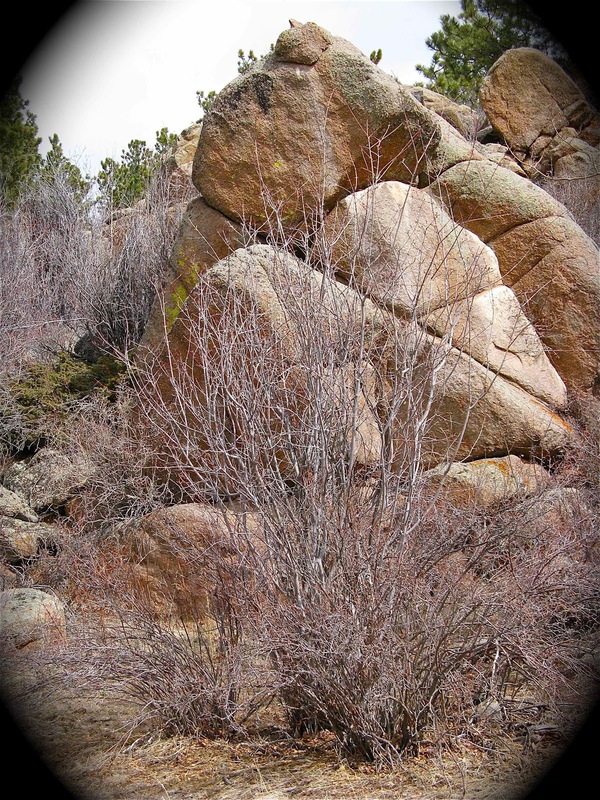 The evidence can be seen just a short distance south of the Medicine Peak quartzite. The Mullen Creek - Nash Fork shear zone is one of the more intriguing geologic features of the Medicine Bow Mountains. 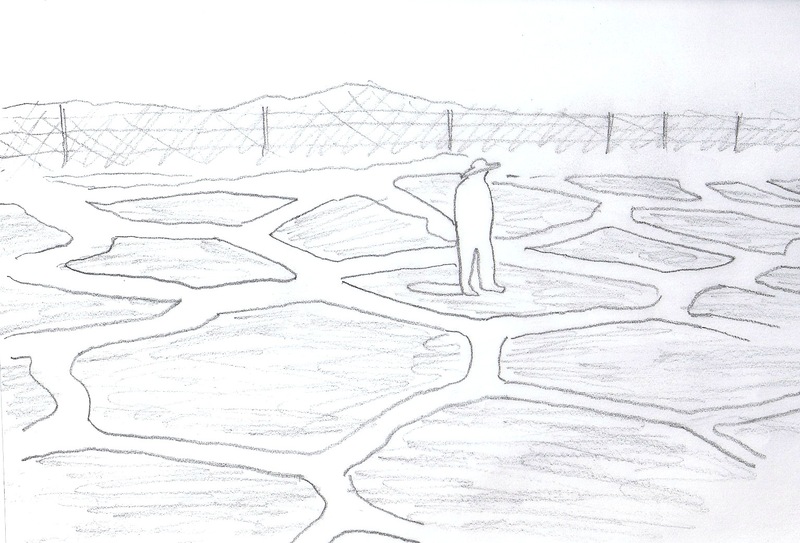 It represents a significant discontinuity in type and age of exposed rocks. Those to the north are close to 2 billion years old, while rocks south of the shear zone are much younger, “only” 1.7 billion years old. 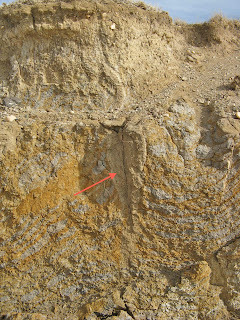 Within the shear zone itself, rocks are intensely deformed, suggesting some ancient catastrophe. The MC-NF shear zone is part of the Cheyenne Belt -- a band of discontinuity and deformation that extends across southern Wyoming. Between 1.7 and 1.8 billion years ago, either terranes (pieces of continents) or arcs of volcanic islands were pushed up against and joined to ancestral North America along this suture zone. The sedimentary rocks at the continental margin were metamorphosed and tilted to near vertical, as can be seen in today’s Snowy Range. 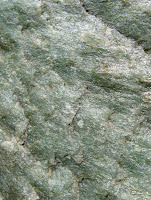 Medicine Peak quartzite is a member of the Lower Libby Creek Group. Modified from Lanthier 1979 (click to view). to the Snowy Range, visible in upper left. Courtesy Google Maps; click to view. The Medicine Bow Mountains are located a short distance west of Laramie, and are easily accessible via Wyoming Highway 130, the Snowy Range Road, in the warmer months. The highway crosses the crest of the mountains at the base of the Snowy Range, where there are great views of the Medicine Peak quartzite. 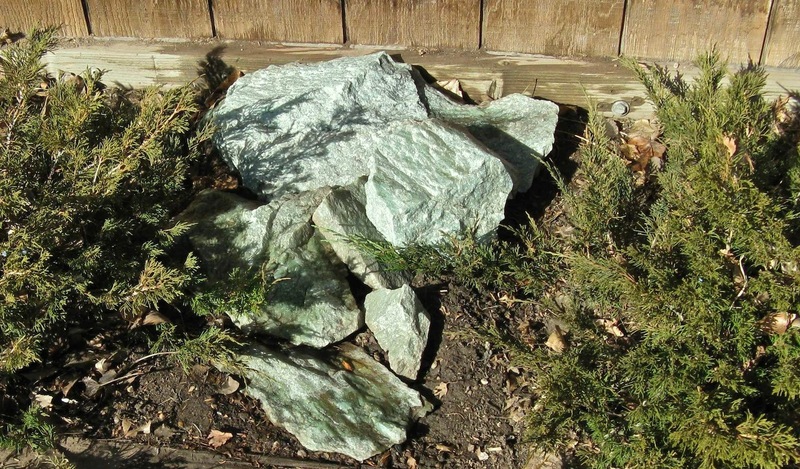 The fuchsite-bearing green quartzite is known from only two locations: north of South Gap Lake, and at the south base of Browns Mountain west of Telephone Lakes, where there is a small quarry. There are scattered green boulders southeast of the quarry site as far as the Towner Lake Road. “Snowy Range green quartzite” was quarried and sold in the Laramie area in the 1960s, mainly for decorative aggregate, occasionally polished and used as decorative stone. There are no longer roads in this area, and one has to walk about a mile through subalpine scenery to reach the "bright emerald green" bed west of Big Telephone Lake. Toto! I think we’re getting close to the Emerald City!! Blackwelder, E. 1926. 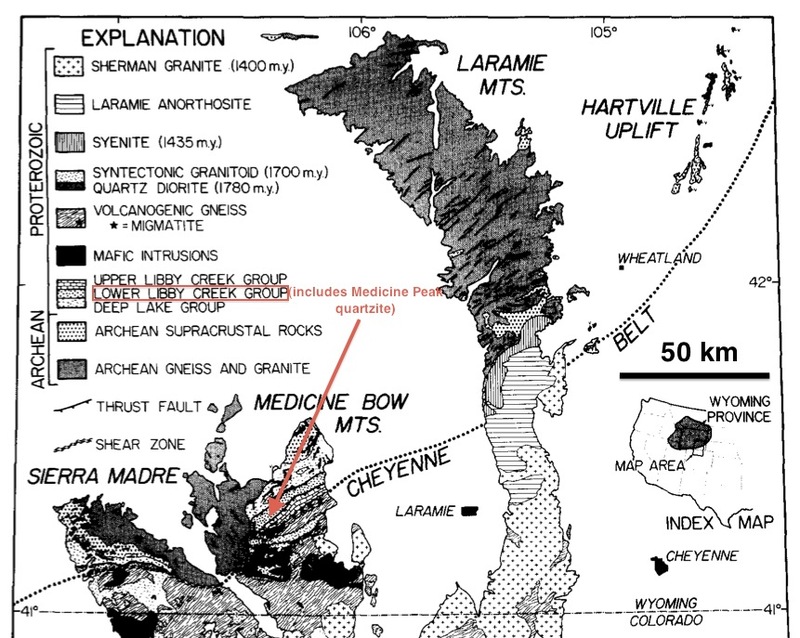 Pre-Cambrian geology of the Medicine Bow Mountains. GSA Bull. 37:615-658. Harris, Ray E. 1991. 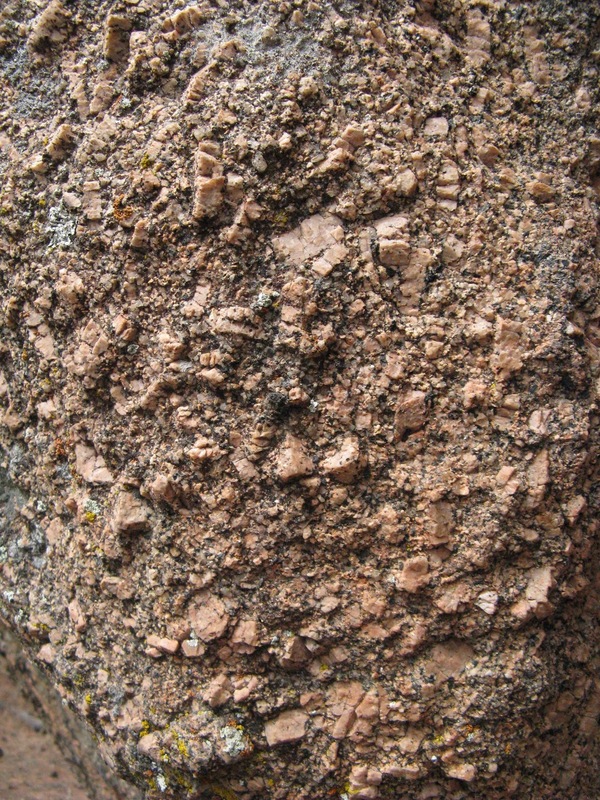 Decorative stones of Wyoming. Public Information Circular 31. The Geological Survey of Wyoming, Laramie. Houston, R.S., Karlstrom, K.E., Lanthier, L.R., Miller, W.R., Bigsby, P.R. 1983. Mineral resource potential map of the Snowy Range Wilderness, Albany and Carbon counties, Wyoming. USGS Misc. 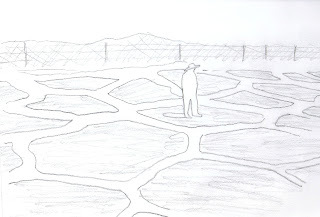 Field Studies Map 12. Houston, R. S. Karlstrom, K.E., Graff, P.J., and Flurkey, A.J. 1992. New stratigraphic subdivisions and redefinition of subdivisions of late Archean and early Proterozoic metasedimentary and metavolcanic rocks of the Sierra Madre and Medicine Bow Mountains, southern Wyoming. USGS Prof. Paper 1520. Karlstrom, K.E. and Houston, R.S. 1984. The Cheyenne Belt: analysis of a Proterozoic suture in southern Wyoming. Precambrian Research 25:415-446. Lanthier, R. 1979. Stratigraphy and structure of the lower part of the Precambrian Libby Creek Group, central Medicine Bow Mountains, Wyoming. Contr. Geol. 17:135-147.